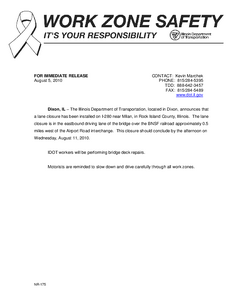 Description: The Illinois Department of Transportation, located in Dixon, announces that the I-74 southbound off ramp to 3rd Avenue will be closed in Moline, Illinois. This closure will take place on Monday, June 11 from 9:00 AM to 12:00 PM. Description: Information about what happens to a claimant's unemployment claim during the next three weeks. 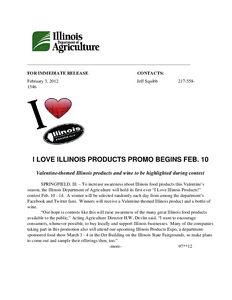 Description: Press Release: To increase awareness about Illinois food products this Valentines season, the Illinois Department of Agriculture will hold its first ever I Love Illinois Products! contest Feb. 10 - 14. Description: The Illinois Department of Transportation today announced that effective Tuesday, November 1, 2011, nighttime lane closures will be encountered on I-270, between the Chain of Rocks Canal and the Mississippi River, near Granite City, for both westbound and eastbound lanes. The lane closures will begin at 9:00 p.m. and the lanes will be reopened by 5:00 a.m., nightly. Traffic will be guided through the work zone utilizing flaggers, traffic control devices, and traffic control signing. 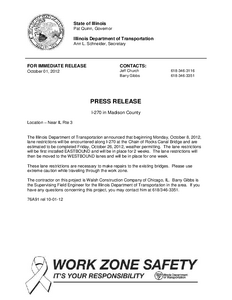 Please use extreme caution while traveling through the work zone. These lane closures are necessary to resurface the existing shoulders in preparation of upcoming stage work pertaining to the new I-270 Chain of Rocks Canal Bridge. This work should be completed by Friday, November 4, 2011, weather permitting. The contractor on this project is Walsh Construction Company of Chicago, IL. Barry Gibbs is the Supervising Field Engineer for the Illinois Department of Transportation in the area. If you have any questions concerning this project, you may contact him at 618/346-3351. Description: The Illinois Department of Transportation announced that beginning Monday, August 9, 2010, there will be daytime lane closures on I-270 from IL 203 (mile marker 4), near Granite City to IL 159 (mile marker 12), near Glen Carbon. 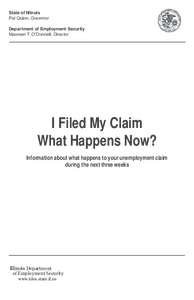 Description: The Illinois Department of Transportation today announced that effective Tuesday, November 22, 2011, the ramp from eastbound I-270 onto southbound IL Rte 3, will be closed to traffic to install temporary concrete barrier. The ramp closure will begin at 9:00 p.m. and reopened by 5:00 a.m., nightly. A posted detour will be in place to guide people to IL Rte. 203, where they will exit and be directed back onto westbound I-270 and sent back to IL Rte. 3. Please use extreme caution while traveling through the work zone. This work should be completed by Wednesday, November 23, 2011, weather permitting. The contractor on this project is Walsh Construction Company of Chicago, IL. Barry Gibbs is the Supervising Field Engineer for the Illinois Department of Transportation in the area. If you have any questions concerning this project, you may contact him at 618/346-3351. Description: The Illinois Department of Transportation announced that beginning Monday, October 8, 2012, lane restrictions will be encountered along I-270 at the Chain of Rocks Canal Bridge and are estimated to be completed Friday, October 26, 2012, weather permitting. The lane restrictions will be first installed EASTBOUND and will be in place for 2 weeks. The lane restrictions willthen be moved to the WESTBOUND lanes and will be in place for one week. Description: The Illinois Department of Transportation announced today that the westbound lanes will be restricted from 11:00 p.m. Monday, October 1, 2012, to 5:00 a.m. Tuesday, October 2, 2012 along I-270 at the Chain of Rocks Canal Bridge. These lane restrictions are necessary to remove the pavement striping. 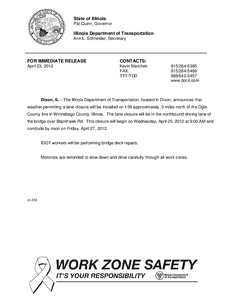 Please use extreme caution while traveling through the work zone. Description: The Illinois Department of Transportation today announced that lane restrictions will be encountered along westbound I-270 at the Chain of Rocks Canal Bridge beginning Monday, September 17, 2012, weather permitting. The westbound lane restriction will be in place on Monday after 11:00 a.m. and will be removed on Tuesday by 5:00 a.m. These lane restrictions are necessary to remove the pavement striping. 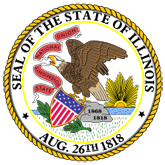 Description: The Illinois Department of Transportation, located in Dixon, announces that weather permitting a lane closure will be installed on I-39 approximately, 3 miles north of the Ogle County line in Winnebago County, Illinois. The lane closure will be in the northbound driving lane of the bridge over Blackhawk Rd. This closure will begin on Wednesday, April 25, 2012 at 9:00 AM and conclude by noon on Friday, April 27, 2012.